Kale has been a hard sell for me. I enjoy almost all vegetables, but I just haven't been able to find a way to make kale appealing. Until now. Turning vegetables into chip form, especially tough, extra-green vegetables like kale, infinitely increase the tasty factor. Although if you're one of those nice folks who enjoy straight-up kale just for the fun of it, you might disagree. Can we still be friends please? These "chips" are so easy. Dry the kale really, really well, then dry it again, and then make sure it's extra dry. Then toss with olive oil, bake for a while, and sprinkle with salt. That's it. I made these one afternoon while I was waiting to pick Andy up from the airport, with the best of intentions to share a healthy snack with him when he arrived. They were so good that I ate them all before he got home. Oops. I feel like a broken record, telling you over and over about foods I used to hate and now I love. It's happening so often lately that I'm contemplating making it a regular feature. That way, when I run out of ideas, I'll be forced to try even more new things! Do you have any previously hated foods that have found a way into your heart? 2. Place the kale leaves into a salad spinner and spin all of the water out of the kale. Dump the water and repeat one or two times more just to make sure that the kale is extra dizzy and dry. Use a towel to blot any extra water on the leaves. Place the kale on the baking sheet. 3. Drizzle olive oil over the kale leaves and use your tongs to toss and coat the leaves. Bake for 12-20 minutes until leaves are crisp. Take a peek at the 12 minute mark – the timing all depends on how much olive oil you use. Use a spatula or tongs to touch the leaves, if they are paper-thin crackly, the kale is done. If the leaves are still a bit soft, leave them in for another 2 minutes. Do not let the leaves turn brown (they’ll be burnt and bitter) Remove from oven, sprinkle with salt and serve. I think finding out we love foods we used to hate is a product of becoming a better cook. So I would interpret your newfound love of so many foods to mean you are rockin your kitchen skills! In my case, many things I used to detest were the result of the cooking style used to introduce me to them, and now I have to say I am pretty much open to eat or try anything - well, except cooked carrots - I don't why I can't stand them and I am always trying them to see if it's changed and it never does! One of the women in my book club made these kale chips for a snack and they were a huge hit. 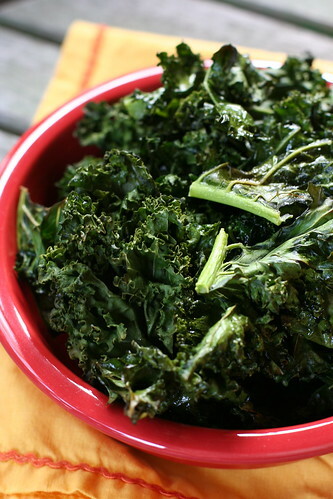 They're such a tasty way to get the awesome health benefits of kale. I used to hate oatmeal. Haaaaaaaate. I still hate regular oatmeal but I've since discovered steel-cut oats and it is my absolute favorite breakfast. I eat it every single day and miss it when I'm traveling. I don't know if I would call it hate, but I was scared of brussel sprouts. They have a bad reputation. But then I started seeing all these delicious recipes on food blogs (White on Rice Couple in particluar) and gave them a try. Now I really like them. So glad to hear you got the green light! Which area will you be in? Would love to meet up. Also if you want to go to any social work/psyc stuff let me know. I need to start meeting people up here. I used to hate olives and pickles...can't get enough of them now! Kale chips are yummy! There is a pizza restaurant in Portland that serves a kale salad that is amazing. It has a lemon-shallot dressing and some sort of grated cheese mixed in. I plan to try to duplicate the recipe when the kale in my garden is ready to eat! I hate raisins, but I don't shy away from making recipes that include raisins. They are one of the only foods that I really don't like, but have been growing on me. Beets and green olives are two things I did not prefer in the past and now really, really like. Fish is also something I never really liked, but my mom doesn't like it at all so I didn't grow up eating it. And now, it is one of my favorite proteins.